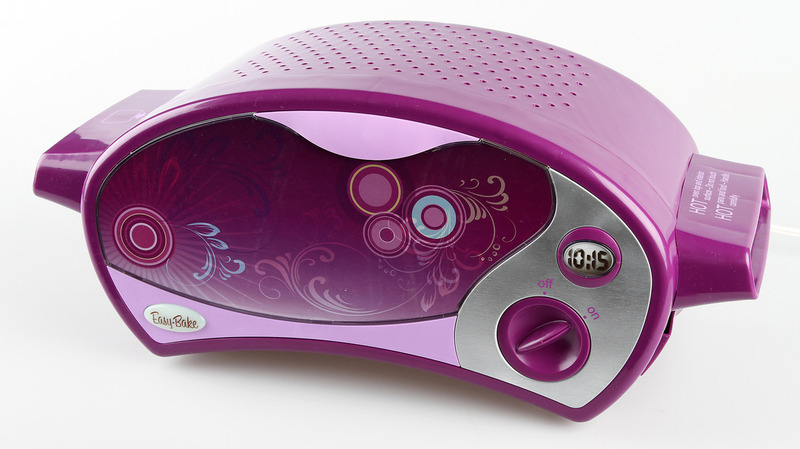 Hasbro's pink Easy-Bake Oven is under fire for reinforcing gender stereotypes. We've been focusing on some serious news today. Here's something on the lighter side. A New Jersey teenager who launched a campaign to get Hasbro to make a gender-neutral Easy-Bake Oven is expected to meet with the toy company Monday afternoon. According to The Associated Press, the oven's team at Hasbro invited 13-year-old McKenna Pope of Garfield, N.J., to share her thoughts and ideas. McKenna wants the company to make the pink and purple oven in more boy-friendly colors and also feature boys in their marketing for the toy. The oven, she says, reinforces gender stereotypes to the point that her younger brother thinks boys shouldn't cook. "We continue to enforce this stereotype that men don't cook, they work," Pope says in a YouTube video created as part of her effort to get Hasbro to change the way it makes and markets the toy oven. Her online petition has garnered 44,000 supporters since it was launched in November and has the backing of top chefs like Bobby Flay. Pope's campaign seems to be part of heightened gender messaging awareness in toys this holiday season. In Sweden, a toy company recently revamped the way it advertises toys to boys and girls. The company, Top Toy, was told by a Swedish regulator to stop advertising using stereotypes, toy analyst Sean McGowan of Needham & Co. tells NPR's David Greene. So in Top Toy's 2012 Christmas catalog, boys are shown playing with a pink ironing board set, for example, and girls are shown playing with a Nerf rifle. "I think what they were worried about was causing gender identification needlessly — to turn off passive learning, passive expression down the road, even passive economic opportunity for girls or boys if they felt they couldn't do something because of societal norms," McGowan says. Time will tell, McGowan says, whether trying to take gender out of toys will affect play habits. "It'll be interesting to see how this changes the attitudes of parents and of kids over time or whether or not it does. There may be some hard-wired differences," he says. Meanwhile, Lego has developed and marketed a line of toys specifically to girls after researching for years how to get girls to play with the toy bricks. The Lego Friends line includes a cafe, a vet's office and a pet salon. The figures, McGowan notes, are bigger and are more realistic than other figures because Lego learned that girls see them as avatars of themselves. "By unlocking that mystery — what is it that the girls are looking for out of the play? — Lego was able to get a lot of girls and hundreds of millions of dollars in revenue just in one year, whereas they couldn't get that before," McGowan says. Ultimately, for good or bad, there really are just fundamental differences between boys and girls, he says. "I don't think anybody here is kidding themselves that we're going to get girls to like all boys toys and boys to like all girls toys," McGowan says. "But I think it's a noble effort to say, 'I have a product I believe in, that I think is good for kids — what can I do to make it more attractive to more of those kids?' "